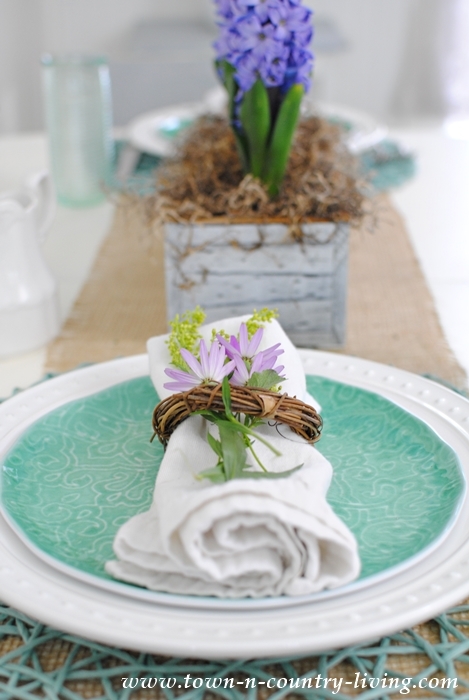 Do you love simple centerpieces that aren’t fussy but lend an air of prettiness to your table? 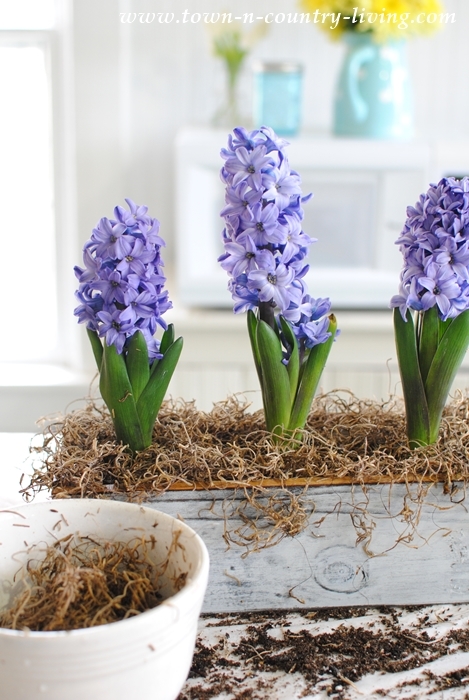 I found a 6-pack container of spring hyacinth bulbs at the garden center and turned half of the pack into a spring bulb centerpiece. It was easy to make and didn’t require any artistic flower arranging skills. 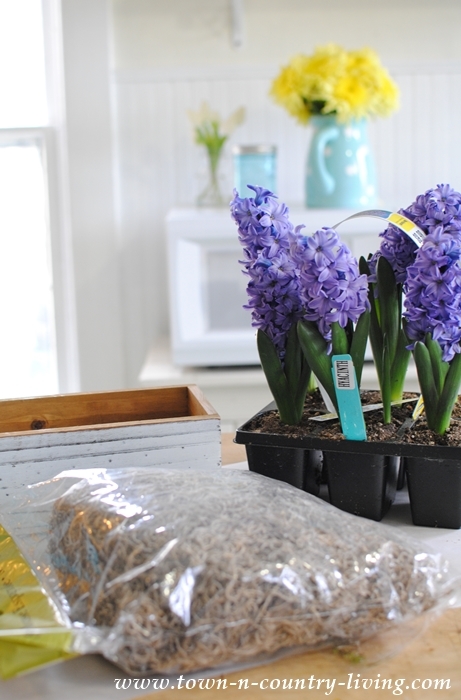 I can never resist purple hyacinths. 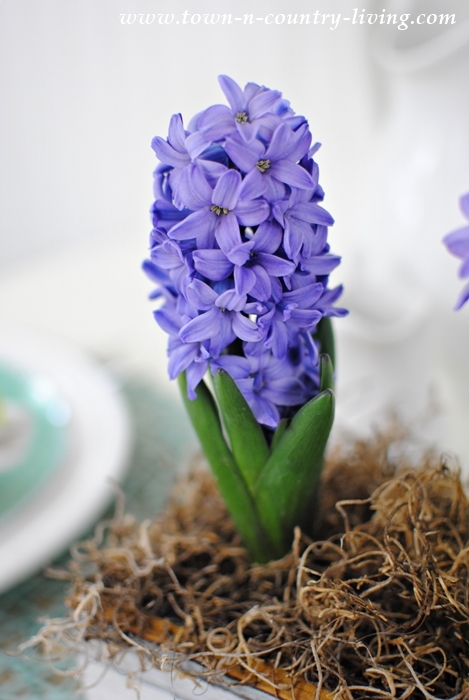 They’re the most fragrant of the hyacinths and their scent evokes special memories for me. 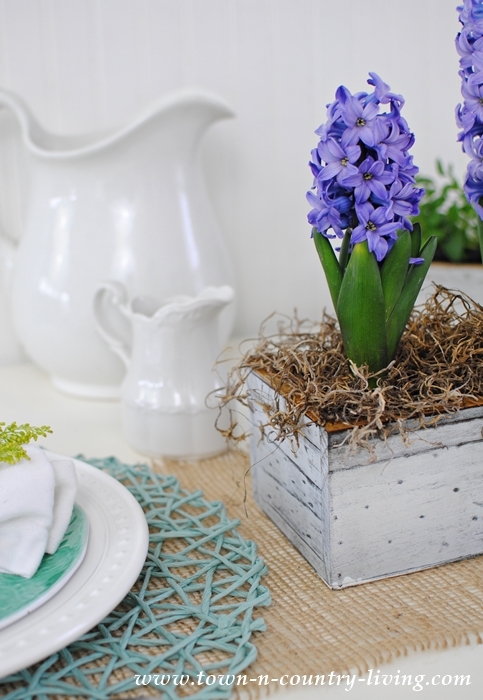 It took me just minutes to create my spring bulb centerpiece using a painted wooden box, hyacinth bulbs, and a bit of Spanish moss. 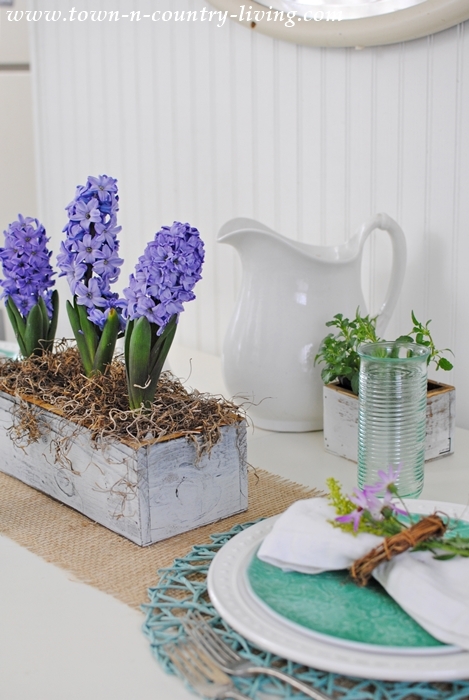 Start by lining a wooden box with wax paper to protect the wood from the dirt. 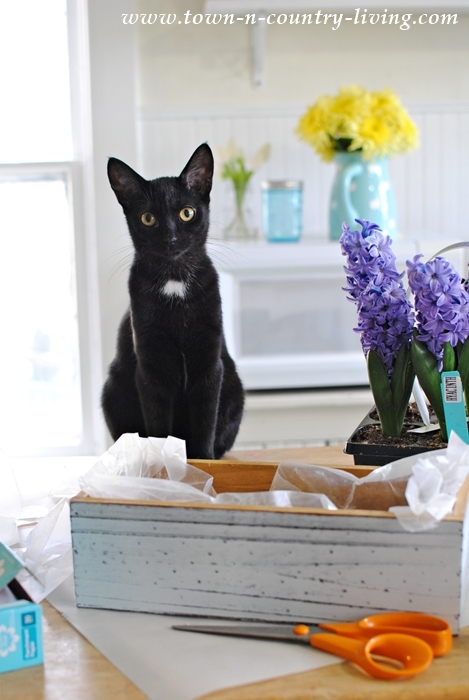 The most important centerpiece-making tip is to employ a special helper. Sadie volunteered and I couldn’t refuse. She’s our most recent rescue kitty. Place your bulbs in the box, evenly spaced. 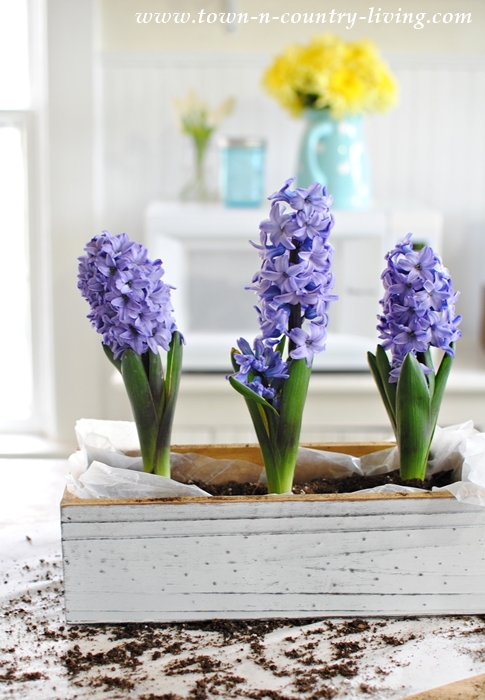 Fill with potting soil, but leave about an inch at the top so water doesn’t overflow when irrigating the bulbs. Cut off the excess wax paper at the top of the box. Cover the dirt with Spanish moss. I like to wet the moss with water because it’s easier to work with. 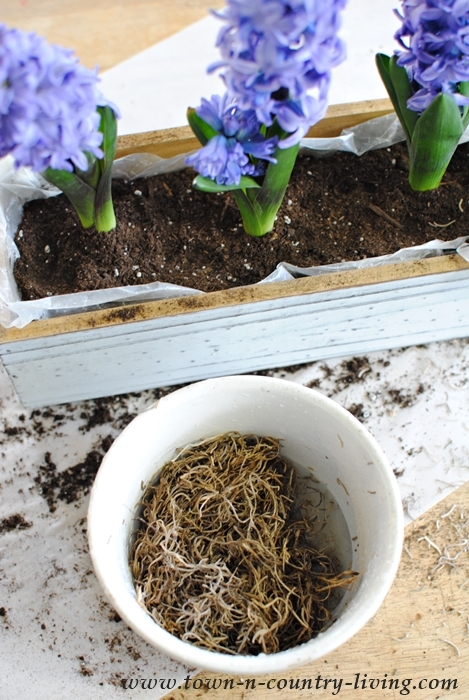 Pour water over the moss in a bowl and wring out excess water before placing it. I like to let some of the moss spill over the edges of the box. 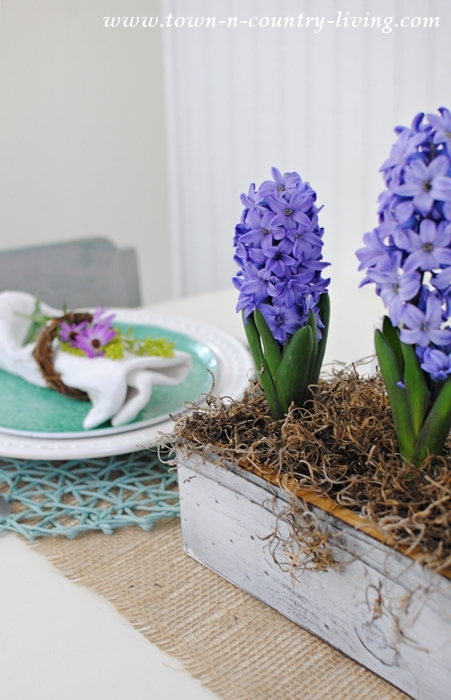 And that’s all there is to creating your spring bulb centerpiece. I placed it on my kitchen breakfast nook table. 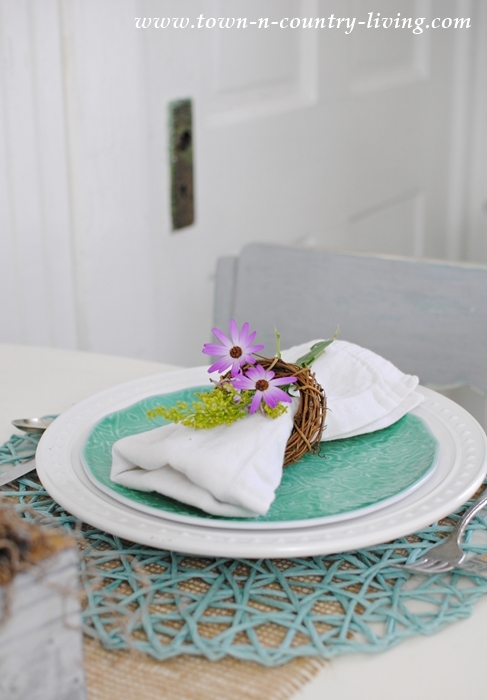 I used my new dishes from World Market for my spring table setting. 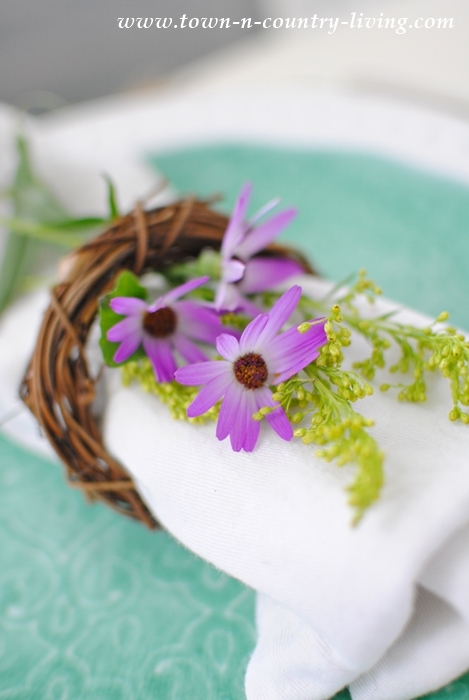 Pretty purple flowers and green sprigs are tucked in a twig napkin ring. 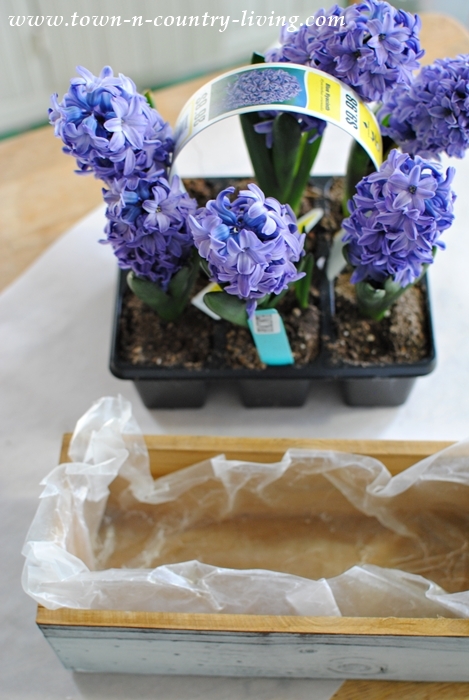 So I mentioned that purple hyacinths hold a special memory for me. 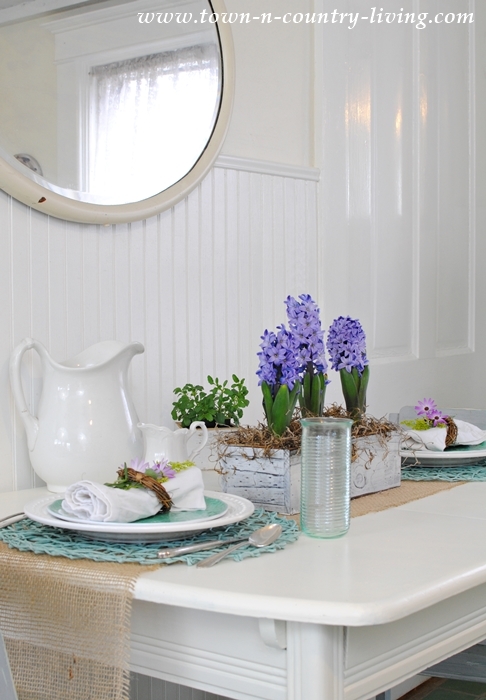 When my daughter Stephanie was born in February, I had purple hyacinths in my hospital room. The fragrance filled the room and was so dreamy. It lifted my spirits and even the doctor commented on the wondrous scent. My daughter Bridget was also born in February, 2 years later. Once again I had purple hyacinths in my hospital room. So every time I smell them, it reminds me of the birth of my precious daughters! When my spring bulb centerpiece begins to fade, I’ll plant the bulbs out in the yard so I can enjoy them again next year. For now, I get to enjoy their fabulous fragrance and remember the birth of my beautiful girls! What a sweet memory and so pretty! 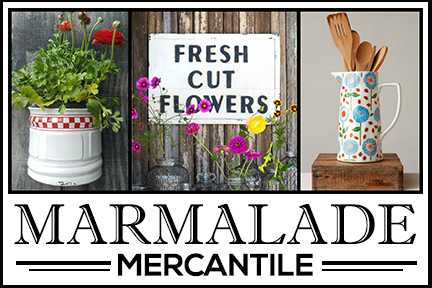 A beautiful and fragrant centerpiece for a most wonderful table! 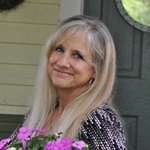 Have a great week Jennifer! 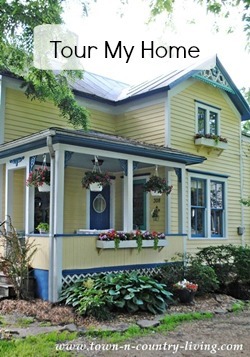 I love this idea, and even more, your special memories! The table looks o pretty. And what a lovely story you shared. 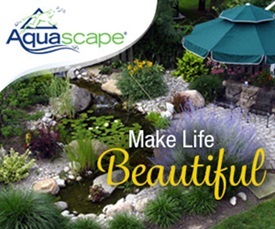 I hope spring is finally in your area. Your table is beautiful. Even better that it smells wonderful.